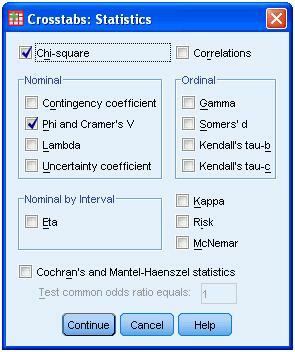 The chi-square test for independence, also called Pearson's chi-square test or the chi-square test of association, is used to discover if there is a relationship between two categorical variables. 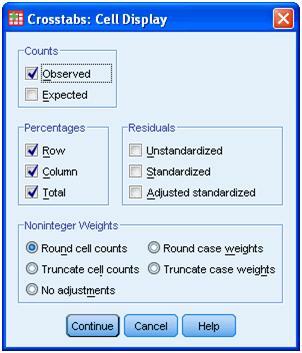 Assumption #1: Your two variables should be measured at an ordinal or nominal level (i.e., categorical data). 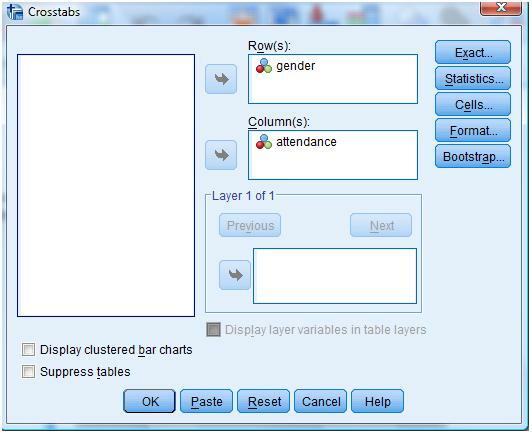 You can learn more about ordinal and nominal variables in our article. Assumption #2: Your two variable should consist of two or more categorical, independent groups. 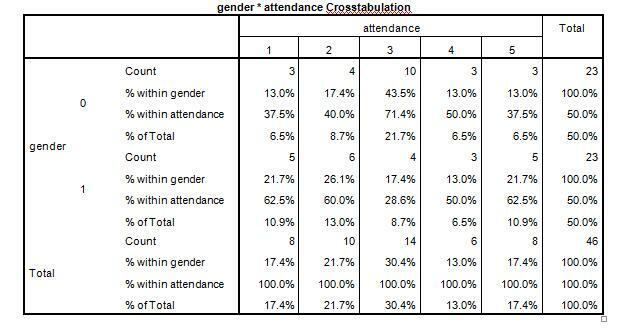 Example independent variables that meet this criterion include gender (2 groups: Males and Females), ethnicity (e.g., 3 groups: Caucasian, African American and Hispanic), physical activity level (e.g., 4 groups: sedentary, low, moderate and high), profession (e.g., 5 groups: surgeon, doctor, nurse, dentist, therapist), and so forth. 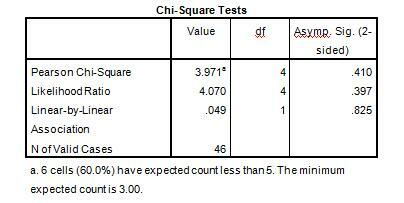 When reading this table we are interested in the results for the Continuity correction. We can see here that χ(1) = 3.971, p = 0.410. This tells us that there is no statistically significant association between Gender and Preferred Learning Medium. That is, both Males and Females equally prefer online learning vs. books. Phi and Cramer's V are both tests of the strength of association. We can see that the strength of association between the variables is very weak. We can observe this based on the sig. values.